It is said that in a previous life, Yeshe Tsogyal was born as a merchant during the time of a former Buddha. The merchant went before this Buddha and vowed not to be reborn except for the benefit of beings. Subsequently, she later manifested as the Indian goddess Ganga, who sprang from Lord Shiva’s topknot to flow as the River Ganges, and then as Sarasvati, the Indian goddess of knowledge, language and music. According to some accounts, Padmasambhava invoked Sarasvati to manifest as a woman who would help disseminate the teachings of secret mantra. Yeshe Tsogyal is regarded as a dakini; an emanation of Samantabhadri, the primordial female Buddha, and also of Vajrayogini, Tara and Buddhalochana. She was born in 777, into the aristocratic Kharchen family of the Chokdro Dri area. At the time of her conception, her mother had dreamt that a blue woman appeared in the sky and sent a star shooting into her womb. Between nine and ten months later, she gave birth to an exceedingly lovely baby girl whose forehead bore the mark of crossed vajras, and whose body gave off the fragrance of a lily. At the same time, a spring of fresh water burst from the ground and formed a pond next to her house (it was later named Tsogyal Lha-tso, the divine lake of Tsogyal, and became a famous pilgrimage site). A number of events occurred in her early life to cause her to give rise to weariness with samsaric existence. She was brutally raped by her first suitor and fought over by her second. When King Trisong Detsen heard of her miraculous abilities and beauty, he sent a minister to bring her to the palace. When the minister arrived at Yeshe Tsogyal’s home, she fled and went to meditate in solitude. Eventually however she became the consort and queen of King Trisong Detsen. 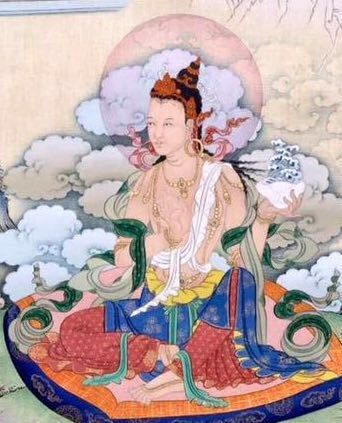 Later the king offered her to Padmasambhava, in gratitude for having received all the empowerments, transmissions and pith instructions of his master. Guru Rinpoche set her free, and she became his disciple. So it was that Yeshe Tsogyal received every transmission given by Guru Rinpoche and came to have great faith him. During the empowerments of the Eight Sadhanas, her flower fell on the sacred mandala of Vajrakila. Through practicing the sadhana she rapidly gained accomplishment. She then spent years receiving all of Guru Rinpoche’s teachings and practising with him as his consort in solitude, becoming his heart-disciple and spiritual heir. Together, they travelled and practised all over Tibet, blessing hundreds of locations as places of spiritual power. In accordance with a prediction by Guru Rinpoche, she travelled to Nepal, and while there restored a dead slave boy, Acharaya Sa-lé, to life. Procuring his freedom, she took him as her spiritual consort and achieved great realisation. Having attained the siddhi of unforgetting memory, she was able to assimilate and collect all of the teachings that Padmasambhava gave in Tibet. At his command she concealed many as ter in specific locations, in readiness for the future time when they would be discovered by their destined tertön, and revealed for the benefit of beings. In particular she received Khandro Nyingthig in Tidro of Zhotö in the Drikung valley. She later concealed these as ter, to be revealed by the tertön Pema Ledreltsal (1291-1319? ), who would then be reborn as the omniscient master, Longchen Rabjam (1308-1363). After her guru, Padmasambhava, had departed from Tibet she remained for a number of years securing the teachings, re-concealing ter and benefitting countless beings. In 837, at end of her life, she departed from Shang Zabulung in her physical body and flew through the sky to Zangdok Palri, Guru Rinpoche’s pure land.